Watching videos via a computer screen or a mobile screen is becoming more and more popular. When watching videos on a computer or smaller screen you want to ensure that you have clear picture that is delivered fast and seamlessly. There are many video add-ons available today that allow you to have crisp picture provided in the best quality possible. 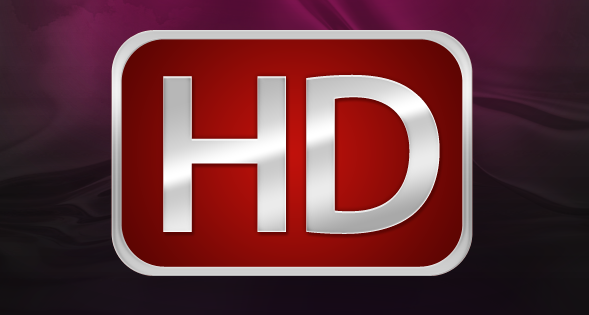 YouTube High Definition is a simple video add-on tool that allows you to play YouTube Videos at the highest resolution available. YouTube High Definition can automatically load YouTube videos in many different resolutions including: 1080p, 480p, 270p, 360p and 240p. It automatically loads YouTube video at the highest resolution available. YouTube High Definition also allows you to watch every video in Wide mode. It is available free through Mozilla Firefox and many other browsers. This add-on is free and can be downloaded from many different websites. Tube Enhancer Plus improves your overall browsing experience by allowing you to watch any videos or playlists while navigating the web. YouTube Enhancer adds a button underneath almost everything that has been uploaded to YouTube including videos, channels and playlists. 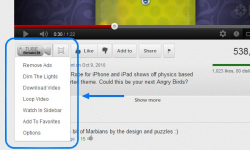 YouTube Enhancer allows you to open the sidebar without needing to go onto YouTube to do it. You can change the location of the button on your screen that suits you best. There are many great features available on Tube Enhancer Plus including one that blocks the annoying ads that come up before and are sometimes embedded into videos. You can set a favorites list that will play videos on the sidebar and customize the way that YouTube looks according to your own personal preferences. It is available as a free download on many different sites, including Mozilla Firefox. SmartVideo for YouTube is another add-on that is designed to improve your overall YouTube experience. It has terrific features that help to make your time spent on YouTube enjoyable and fast. It provides a ‘Smart Buffer’ in order to stream slow connections, buffer preferences, auto loop and more. 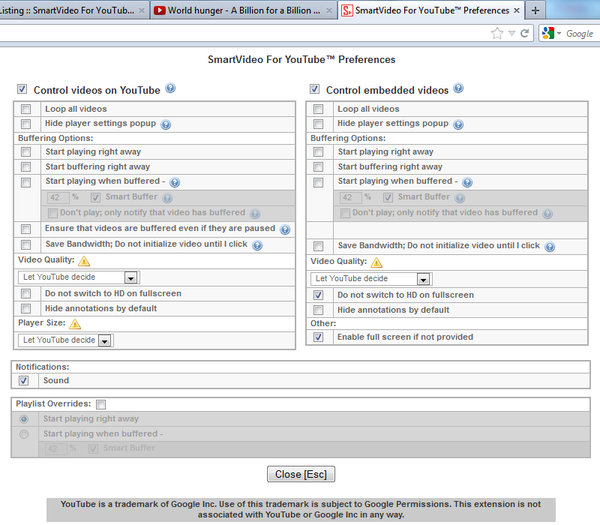 By utilizing the global preferences function, all YouTube videos can start upon your commands- whether it is once the video has completely loaded or as soon as the page loads. 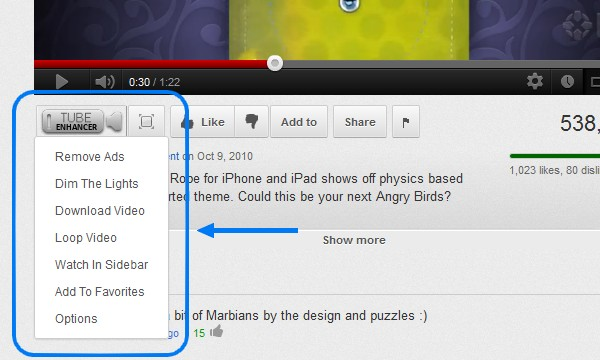 You can also enable the ‘switching to HD on fullscreen’ options, which gets rid of surrounding web clutter. SmartVideo for YouTube is available for free at Mozilla Firefox, Google Chrome and other web browsers. NetVideoHunter Video Downloader is a great add-on for downloading videos and music from popular sites on the web. This tool allows you to download videos and music from Facebook, YouTube, Dailymotion, DivShare and many more. Newer versions feature the possibility to download YouTube video in different qualities including: 360p, 480p, 720p and 1080p. NetVideoHunter downloads video at the best quality possible by default. It is available for free at many popular web browsers and is available for downloaded at www.netvideohunter.com. Video Bookmarks add-on from myVidster provides an easy to use bookmarking tool. Video Bookmarks allows for an easy way to collect, download, organize, backup and share videos from any video host, blog or website. You can download and backup videos from a variety of different hosts including YouTube, Vimeo, Dailymotion and more. It is easy to organize your videos and even host your own channels. Video bookmarks tool will keep your video collection or safe, without having to worry about the video host removing your favorite videos. It is available for free and works with Mozilla Firefox. Video extensions can help make viewing videos online on a computer faster, brighter and clearer. They can also do wonders when used on your smartphone by automatically selecting the best quality for clear picture and fast streaming. Many video add-ons also help you to organize and catalogue your video collection making repeat listening and sharing a breeze. Many video add-ons are free, making them a smart add-on to download for those who watch a lot of content online.